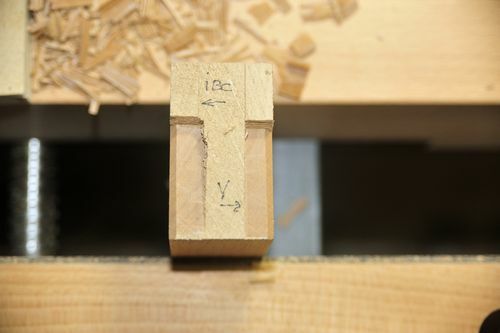 As all my bench chisels have side angles less than 90 degrees, that go all the way to the back of the chisels, not long ago I have decided to look around for some chisels with 90 degrees sides to the backs of the chisels. 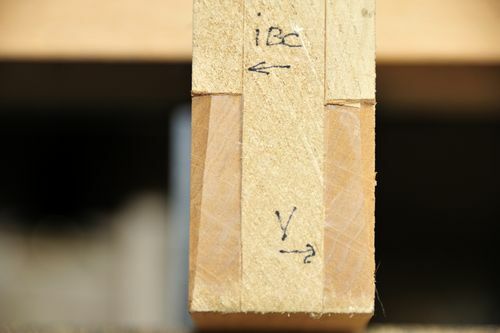 I remember that a while back IBC was looking into making chisels and because I already had two IBC plane blades in use for a long time now, so I’ve decided to look at their chisels. When looking for more information about these new chisels over the internet, I was a bit disappointed as I did not find a lot of information and/or serious reviews about these chisels. 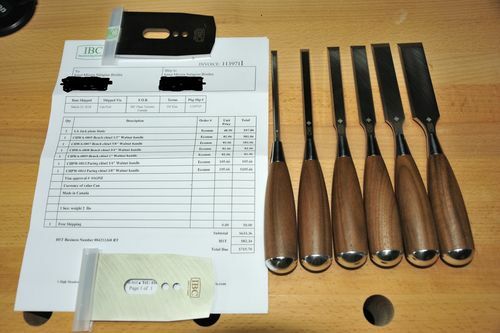 This might be subjective but after I purchased the chisels and after preparing them for daily abuse, I had the feeling they are unjustly not mentioned over the internet as I would have expected, given the high quality of their plane blades. The only person that spent the time to present them properly is Rob Cosman but he can be regarded as biased as he also sells or sold them and he provided valuable input to the IBC company during their design and initial production stages. 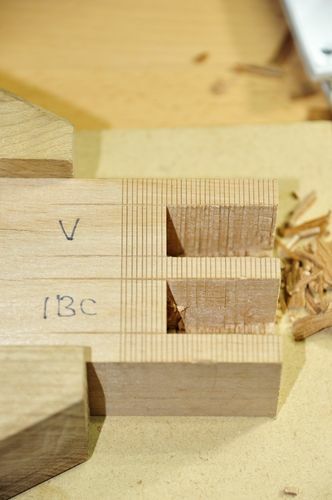 So as an unknown person in this field who pays from his pocket for all the tools and definitely with no affiliation with IBC company, Rob Cosman or anybody else, than the wood, I decided to share my impressions about these chisels. 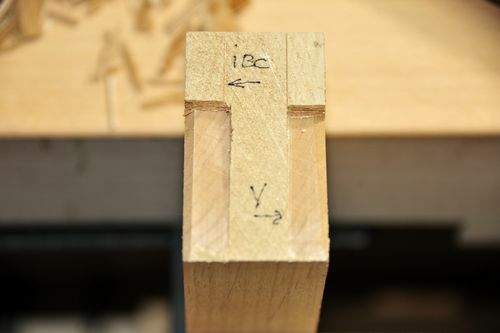 The closest tool to compare with that I own, was the Veritas bench chisel with PM-V11 blade and because I only own the 3/4” in PM-V11 I had to use the 3/4 chisels. The test consisted in a series of chopping followed by the paring action to asses the condition of the cutting edge after chopping. I usually sharpen freehand but for this test I decided to use a honing guide to give the blades the same chances. 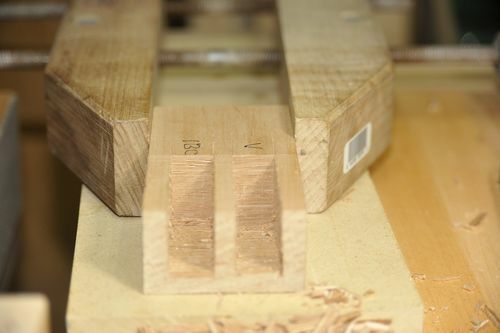 The wood I used to test the chisels was alder, firstly because I had off cuts readily available and I feel that slightly softer wood allows me to asses better the ability of a cutting edge. The blades went through the 1000, 5000 and 20000 grit treatment with no microbevels. The IBC achieved the a proper sharpen state a bit faster than the PM-V11. In the picture above you can see the contenders. The sharpening bevels are slightly off 90 degrees as my narrow chisel adapter for the Veritas MKII honing guide, is not clamping squarely. I will follow up with Veritas on this. This aspect is not relevant for the test as both blades are affected in the same measure. 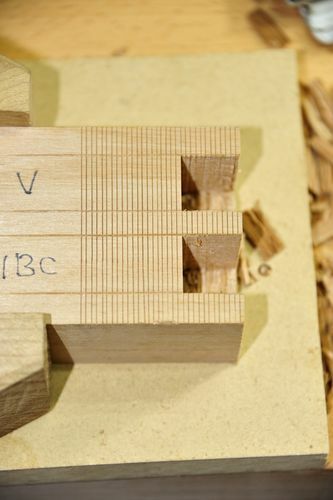 Above is a endgrain of one piece of alder with the paring action of both chisels freshly after sharpening them. No difference in the quality cut and feel. This is the piece of alder supposed to receive the chopping treatment. 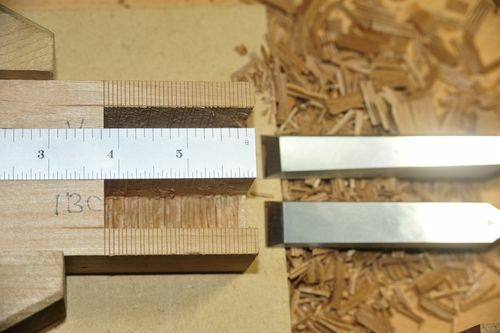 I took the time to mark the cutting thickness to approximately 1/16” so both blades receive a similar amount of abuse. The same piece after 12 chops. Paring action after 12 chops. 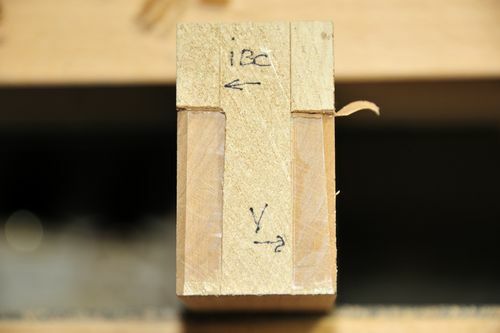 The Veritas blade already developed 2 small chips, one close to the left side the other one closer to the middle of the cut. Both blades were able pare easily and cleanly. The Veritas chips appear to be slightly easier to see, at least for me looking at the wood, not sure if I captured the situation clearly with my camera. 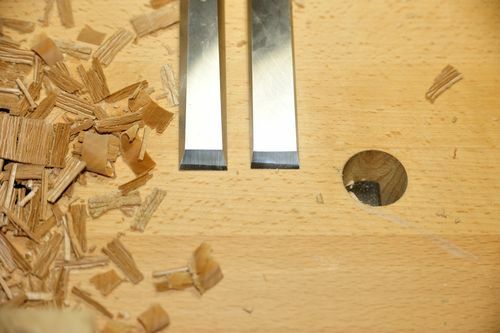 Both blades are capable to take nice endgrain shavings, there is a slight feel difference compared to the initial paring cut. and some more paring. If I am not subjective I had the feeling that the paring push required slightly more force. 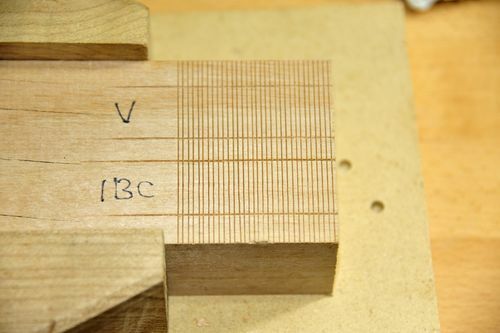 The condition of the blades did not change much, the Veritas chips are still there but both blades did a great job paring, not for a showing endgrain cut but definitely for a inside of a dovetail. I am sorry, I could have gone further with the test up to the point where the blades would show more drastic signs of failure, but I decided to stop here with chopping due to not much time available for playing around. The endgrain condition after the last chop action. The IBC side shows slightly more fiber separation in the upper area, but I have found this to not be a clear sign of the blade condition as at different stages the Veritas side was showing more fiber separation. Above are the blades after abuse. In my shop, the IBC A2 (60-62 RC) is at least as good if not better than the Veritas PM-V11 (63 RC). Considering the Rockwell hardness difference, the PM steel is a bit disappointing to me and I had some similar disappointments with the PM handplane blades. I like more the balance of the Veritas chisel though and the extra length of the blade. I also love the little flat areas on the Veritas handles. When sharpening the IBC achieves a sharp edge in about 80% of the time and number of strokes required by the PM blade with my sharpening stones (Chosera 1k, Shapton pro 5K and Suehiro Gokumyo 20k). I did not have to remove the IBC handles during the initial flattening of the blade, it could be done but is not required, all my other chisels have fixed handles. The great advantage of this feature comes with the ability to attach a paring handle that would allow for more precise paring actions. 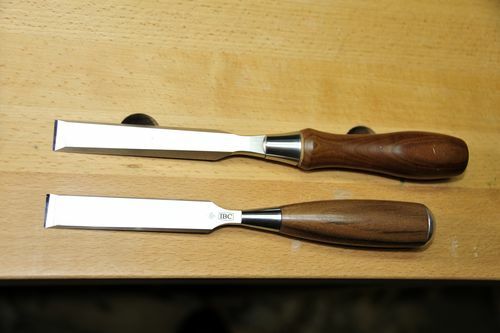 It is great to not have to pay for extra paring chisels and only to change the handles. Also if you so chose, due to the construction you can also hit with a mallet the paring version of the handles. The backs of IBC are only ground and not lapped, the amount of flattening required is acceptable compared to other brands I got to play with over time. Veritas clearly wins here as I had to spend the least amount of time to flatten and the surface of the backs. When it comes to handplane blades my first pick is always IBC when compared with the PM version of Veritas. In my experience even though I pay extra attention during sharpening the PM blades were always eager to play tricks on me, it is more or less like a lottery when it comes to how long I can use the freshly sharpened PM blades. Sometimes I get a long life out from an edge, but sometimes I have the surprise to see chip scratches developing not long after sharpening and especially on smoothing action this is very frustrating. While for a long time I have doubted my sharpening, I pay more attention and I allocate more sharpening time for PM blades with the same surprising results at times. I believe this is more related to the way these blades are produced, if I understand correctly they are synthesized and not forged and that might lead to small inconsistencies in the way the steel holds together, but that is my personal opinion. When it comes to IBC handplane blades, I blindly sharpen them, set them back in the plane and shave wood until I get bored of shaving, they are more predictable and most of the time I get to resharpened because I get bored with that edge and not because the edge fails. If today I would need a western blade or a chisel my first pick to look at would be IBC. Japanese steels are a different story and they are not the object of this review. At the end I would like to make it clear that this review is based only on my own experience and nothing else. This reads like marketing. 1 post. To avoid any futile idiotic discussion about the marketing side of things I have attached the bill. Why I still have it? Simply because they made a mistake regarding the handles I ordered and I still have the picture I took at the time when I received the package. 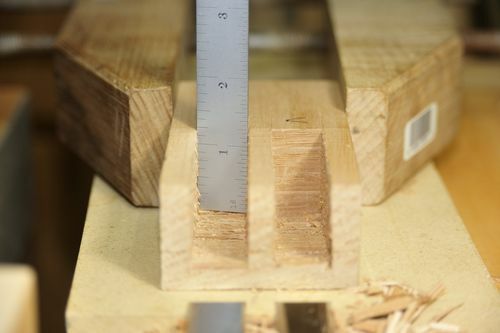 That is correct, all my chisels received a lot of work during the flattening, that is a big minus for these chisels. As the scratch pattern shows they appear to be only ground and not lapped. Once flattened they work beautifully. Nice job on the review. I have had great luck with ibc as well. I have IBC A2 and PM-V11 bu plane blades. I find the PM superior in all aspects. The biggest being edge chipping, the PM blades take longer becore starting to chip. I guess different strokes for different folks. Maybe so, not sure. For this test I have chosen the PM chisel because I did not have anything else to use that would have made the comparison appropriate. Also the intention was not to out the PM steel in the bad light, but to show how good the IBC A2 steel is. I could have used a white steel Japanese chisel but that would have been pretty similar with comparing apples with prunes. I have the PM blades pretty much since they have appeared. I followed up with Veritas about the same issue years ago and they were great in supporting their product, they have sent me a replacement for that particular plane blade I reviewed at that time. Still today when I use the PM blades I am having the same surprises, maybe at that time there was a bad batch of blades and I was lucky enough to receive them, or maybe it is just me looking to intensely at it during sharpening , unfortunately that is my experience. That is why I left the wood talk about it. Good review indeed. Nicely done, thanks for posting. I’m sorry, but that’s such a lazy attitude. You can dismiss outright anything you don’t want to see simply by calling it biased… I really couldn’t care less if he was paid (though he clearly wasn’t). He showed detailed photos of his test, backing up his conclusions! But you ignore all that and essentially call him a liar, based upon what? Nothing. Yet another example of how the internet has ruined civil discourse. Thanks for the review, Ionut. I m sorry, but that s such a lazy attitude. You can dismiss outright anything you don t want to see simply by calling it biased… I really couldn t care less if he was paid (though he clearly wasn t). He showed detailed photos of his test, backing up his conclusions! But you ignore all that and essentially call him a liar, based upon what? Nothing. I am not a good social media person for reasons like that, and after the first instinct of saying, I can’t reproduce…, I recalled the main reason why I spent the time putting this together in the first place. For folks like me who wanted to find more information about a good product and couldn’t find it. Whether the post is helping or not, it is a different story. Thanks Jeff, but I prefer to stay with working the wood, it is much more fun and relaxing.